The MH-C9000 WizardOne Charger-Analyzer for 4 AA / AAA NiMH / NiCD Batteries from Powerex charges 1-4 AA or AAA NiMH or NiCD batteries via 4 independent slots. It supports batteries with capacities of 100-20,000mAh. The large, backlit LCD screen displays capacity, voltage, elapsed time and current. The charger provides 29 selectable charge and discharge rates, including 19 charging currents from 0.2-2.0A (200-2000mA) and 10 discharging currents from 0.1-1.0A (100-1000mA) in increments of 0.1A. - Charging current adjustable from 0.2A to 2.0A in 0.1A increments. - Useful when battery needs to be recharged without determining the capacity of the battery. It should be used on batteries known to be in good condition and have been in continuous use. - Discharging current adjustable from 0.1A to 1.0A in 0.1A increments. - Useful for analyzing the amount of charge stored in the battery. Battery not recharged at the end of the cycle. - Performs a charge-discharge cycle for a programmable number of times. Charging and discharging rates are also selectable. At the end of the cycle, a final recharge is applied. Max. 12 cycles. - Suitable for cycling the dormant batteries to recover capacity. - First recharges the battery, rest for two hours, discharges, rest, then recharges again. Charging and discharging rates are programmable. - Reports the discharge capacity at the end of the cycle. 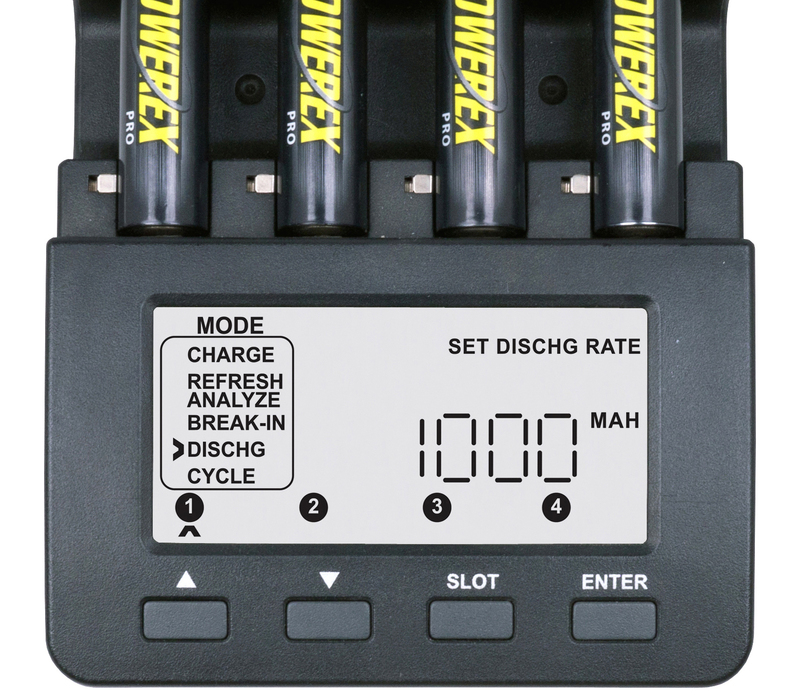 - Useful when the battery capacity needs to be determined. Also useful for battery with degraded performance. - Applies a 16-hour 0.1C charge (0.1 times the capacity of the battery), rest for one hour, followed by a 0.2C discharge, rest again, and finally a 16-hour 0.1C recharge again. - This process is also known as “Forming Charge.” Also recommended with batteries that cannot be rescued by the Refresh & Analyze mode. 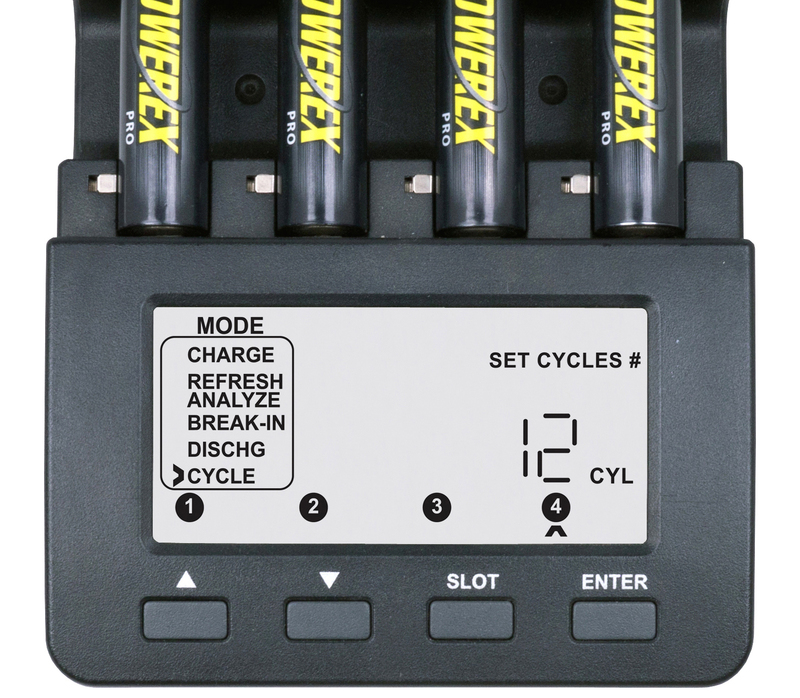 - The process follows the IEC standard for determining battery capacity. I don't usually take the time to write reviews, but I have to tell you all, this charger is amazing. I purchased this charger over 6 years ago and use it daily. It has not failed me once. This unit has saved me a ton on money over the years. It keeps my batteries running at peak performance. Don't hesitate, get this charger and some Powerex batteries (AAA or AA). You'll be grateful. This far out performs your average box store off the shelf charger. Simply the best. I have recovered soooo many batteries with the Refresh/Analyze or if needed the Break-in function. Once I know a battery is good, I just pop it in and let the automatic function do it. A LOT of Technology in a Small Charger/Analyzer! I have only had my PowerEx MH-C9000 charger-analyzer now for just about two weeks, but it has been running constantly since it arrived. In order to keep this review short, all I can say is "WOW", what a charger! At the time of this writing, all my AA and AAA Nicads and NiMH batteries are all analyzed and charged up, ready to go. I was even able to 'revive' two Eneloop NiMH's that I thought were too deeply discharged to save, but I was able to 'bring them back' and their capacities are just a little short of full. For a small flashlight, that is of absolutely no concern whatsoever. I must say that this charger does have a learning curve, but it is small, overall; and there are enough reviews of this charger-analyzer out there on the net and on YouTube the learning curve is pretty shallow overall. One thing the directions did not make perfectly clear but the reviews out there did is that you have the ability to charge only one, or two, or three or four batteries at a time. They can be different sizes AND they can be NiCad or NiMH and you can be performing different functions with them too. Every slot in this charger is independent of others around it. 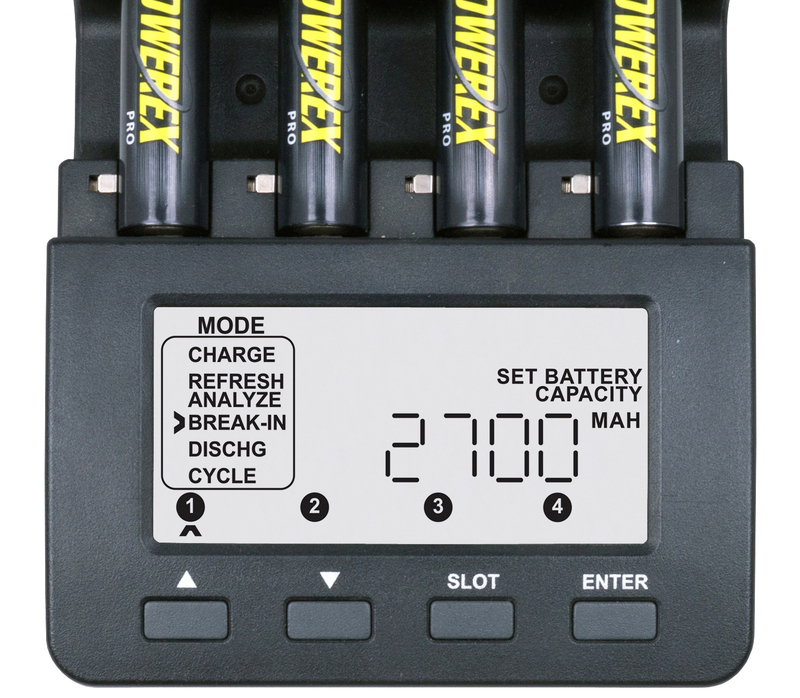 This is the nicest, most comprehensive and most flexible battery charger I have ever used in over 25 years of using rechargeable batteries. I have seen battery technology really change and advance over the years and finally there is a charger available that is as advanced as the kinds of batteries we now have to choose from for our varied uses. 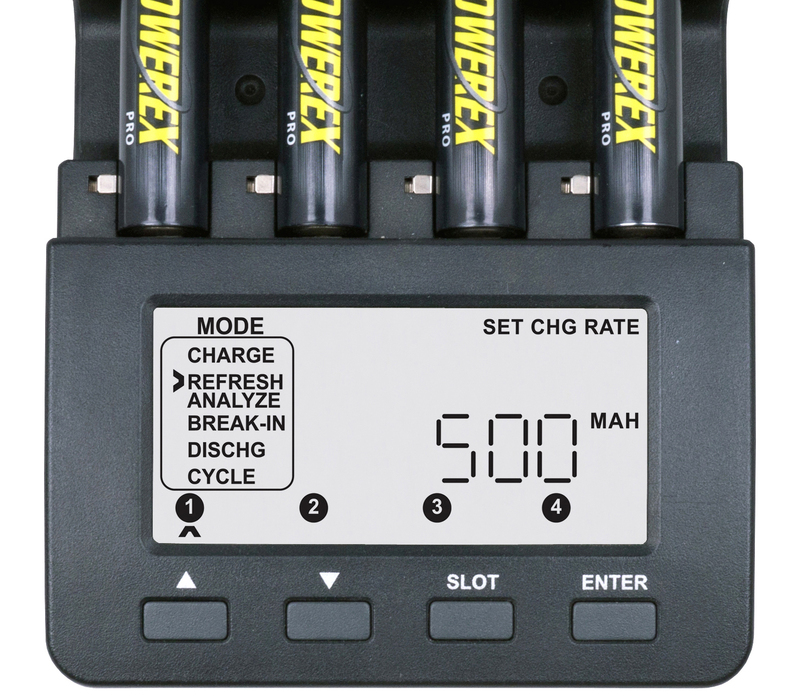 This is a five star unit and I have been recommending it to all my friends who use rechargeable AA/AAA Nicads or Nickel Metal Hydride batteries. Hands down the best most feature packed smart charger on the market !! Theses are pry the best feature packed battery chargers on the market period. I have read a lot of reviews where people are crying like babies about have to press to many buttons, I just laugh if someone thinks pressing a few keys is to many steps to setup charging mode you want to be in and how mah capacity the battery in that slot is then, buy a cheaper unit and stop crying, Theses are the same people that text and type all day pressing keys !!. I always start new batteries with the break in mode takes about 36-40 hrs onetime when you 1st get the Eneloops then just regular charging after that. Best chargers out there just set down and read the booklet that comes with it and yes you may need to take time and read it again, We leave the booklet out with the chargers to reference if needed.